So, the worst struggle in this fast and catchy era I am assuming, is time struggle. Tell me about it. Time and none. Time which by far is the crucial crisis for literally everything, including cooking taking place in our kitchen (Kampung Fried Rice, Chinese Mixed Vegetable Stew, Beans Thoran & Mixed Vegetable Soup). I know. I am aware. I go through it daily. Nevertheless, my motto is still a home meal. One which I try my best not to compromise. Thus, how do I keep it going? How do I manage my time for home food? Well, if you know and you have mastered the art to keeping it simple in your kitchen, you are already your own winner (Bean Sprouts Salted Fish, Kailan Oyster Sauce & Hong Kong Style Steamed Fish). Of course, every now and then, its worthiness to an elaborated dish (Aloo Gobi, Gado Gado & Chloe Masala). Otherwise? 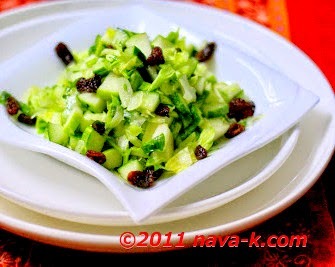 Take this Apple Cucumber Salad as an example. A healthy temptation. Easily put together. Right. 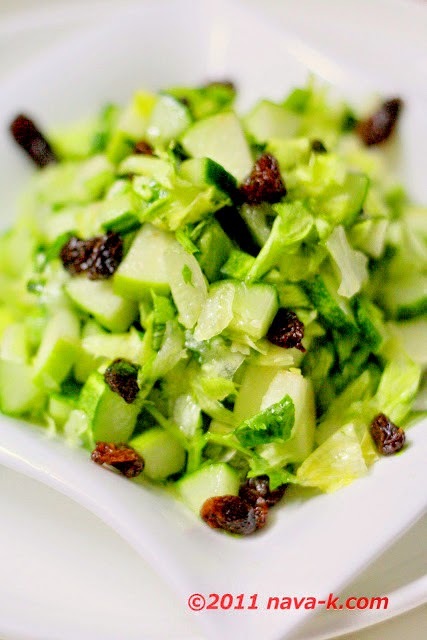 Apple, cucumber, lettuce leaves, dried blackcurrant, olive oil, lemon juice, brown sugar and salt. Bang! Green is our food crunchiness and tastiness. Happy tucking in everyone. Soak cubed apples, cucumber and lettuce leaves in a bowl with ice cubes for about 10 mins to sustain and retain crunchiness. Into a mixing bowl, add oil, lemon juice, sugar and salt. Whisk for a couple of minutes, add greens and blackcurrant. Toss all together and that's it. Great-looking salad. Bet it tastes just as great. A good way to clear food in the fridge. That looks beautiful! So fresh and light and gorgeous :) Love! I love salad awhh thanks for sharing this recipe here!! hi nava, i would love to have the apple cucumber salad cold, for my noon lunch.. together with my favorite smoked salmon sandwich..mmmmm.. yummy the salad looks so crisp and delicious. Great tip about the crunchy effect! One of my favourite combo sweet and sour dressing in a salad. love the salad dear...very healthy n colorful ! Mmmmm....this is my kind of snack! Looks so refreshing! Great salad! Apples are a great addition to salads! Nava this is a beautiful salad! Fresh simple ingredients treated beautifully! ....and your photos are stunning! Delicious! thanks so much for all the great comments everyone and yes, it was a good change for me away from spicy food especially. Green and crunchy-sometimes your body just craves this kind of stuff. With all the rich food around the holidays this dish is a nice break from it all. Your plating is so vibrant and inviting. Great post-yum! I like to do that as well after eating heavy meals I will just have a nice salad for dinner a few nights in a row. This looks fantastic with the black currents. Interesting combination... cucumber and apple. I wonder what it taste like. Oh, I can imagine how this is going to taste! Delicious!! A very simple and comforting salad ! !